Sunday Services are at 9:30 a.m.
Coffee and Fellowship follows the Service in the Parish Hall. All are welcome. Wednesday Evening Eucharist at 5:30 p.m. , followed by a potluck and Study. Please bring a dish to pass. All are welcome. Stations of the Cross. Friday’s during Lent, we will have Stations of the Cross at 5:30 p.m. After the service, we will go out for a Buy Your Own Fish Fry at a local restaurant. All are welcome. Palm Sunday Eucharist, April 14th at 9:30 a.m. Weather permitting, we will begin outside, with the blessing of the palms and procession into the church. We will read the Passion Gospel and begin looking ahead to Holy week. Tuesday, April 16th. Eucharist at 5:30 p.m. in the Chapel. Wednesday, April 17th. Eucharist at 5:30 p.m. in the Chapel. Maundy Thursday, April 18th. Everyone will begin by eating together, a simple meal of breads, nuts, fruits and cheeses, in the Parish Hall at 5:30 p.m. During the meal, we will hear the scripture story of the Last Supper, and Jesus washing the disciple’s feet. Communion will follow in the Parish Hall, followed by the beginning of the Watch in the Chapel. Good Friday, April 19th. The Chapel will be open for the Watch throughout the morning when the Good Friday Liturgy begins at 1:00 p.m. This service includes the readings of the day, the Passion Gospel from John, the Suffrages and Veneration of the Cross. Communion will not be offered, as we keep the idea of a single liturgy extending from Maundy Thursday thru Easter, as we focus on Jesus’ death and the forgiveness and mercy of God from the Cross. Holy Saturday, April 20th. 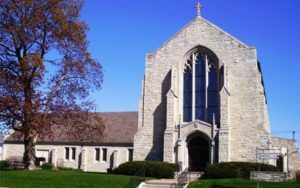 This day will be kept, starting at 9:30 a.m. in the Chapel, with a simple liturgy from the prayer Book, consisting of prayers, readings and a canticle from the funeral liturgy. After the service, everyone will be invited to help get the church ready for Easter Morning. Easter Sunday, April 21st. The day begins at 6:00 a.m. with the lighting of the new fire, followed by the vigil with appropriate readings. These are in preparation for what we do later in the morning, at 9:30 a.m., when we renew our baptismal covenant and celebrate the Eucharist. Following the 9:30 a.m. Eucharist, Fr. David and Marilyn invite everyone to stay for Easter brunch. All are welcome.